Attack of the 50-Foot Monster Mania #3 DVD New Sealed - Rare Out of Print! 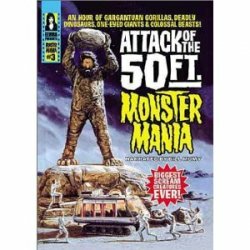 MyMovieMonsters.com > DVDs > Vintage Horror > Attack of the 50-Foot Monster Mania #3 DVD New Sealed - Rare Out of Print! Host Elvira, Mistress of the Dark, brings viewers on an adventure of monstrous proportions. With razor-sharp teeth, deadly claws and giant feet, giant movie monsters have left their oversized imprints in film history. Not available new anywhere else but here! This is #3 in the rare Monster Mania DVD series. The terrifying one-hour special Attack of the 50 Foot Monster Mania showcases such films as King Kong and Attack of the 50 Foot Woman, examining why giant monsters frighten us and why cultures from American to British to Japanese are so obsessed with the monster phenomenon. Highlights include spectacular clips and trailers from The Lost World (1925), King Kong (1933), Mighty Joe Young (1949), Tarantula (1955), Godzilla vs. the Sea Monster (1966), Jason and the Argonauts (1963) and many more; interviews with producer and special effects supervisor Ray Harryhausen, director and author Don Glut and numerous film critics and historians.